Last week I wrote a piece called An Epic Advantage to Windows 8 & the Cloud. I was happy to share that Windows 8.1 and Windows SkyDrive (soon to be renamed Windows OneDrive) automatically maintain the passwords for wireless networks across devices. For the most part the article was well received, but there were some security conscious individuals (as well as one Aluminum Foil Hat Brigade Member) who saw this as anything from a security flaw to a government conspiracy to steal your passwords. While I am no longer with Microsoft the way I once was, I honestly do not consider them to be evil or conspiratorial. As such I as this feature as a huge advantage, which resulted in more than one e-mail asking where my security-conscious side had disappeared to. Of course I still believe in security, but have always felt that security has to be balanced with practicality. After all, in what universe do you not believe that the NSA or whatever government spy organization (or Dana Epp for that matter) would actually need you to give them your passwords in order for them to log on to your wireless network? However I do know that for the past nine years I have been getting phone calls from my parents, sister, aunts, and everyone else who visits my parents’ house asking me what their WiFi password is… as if that is something that I am supposed to remember. My aunt Maryn, whom I love deeply, has visited my parents’ several times, and each time my mother calls me and asks what the password is. Storing this password (for a very NOT high-sec network) is not a threat to anyone, nor would anyone in the government find anything interesting in it. I outlined in that article the practical benefit that I experienced with this feature. However let’s say we are no longer talking about the WiFi network of Arthur and Miriam Garvis. Let’s instead talk about a corporate environment where there is a policy to not save passwords. No problem… in the computer settings there is an entire section on SkyDrive, and within that there is an entire section on Sync Settings. 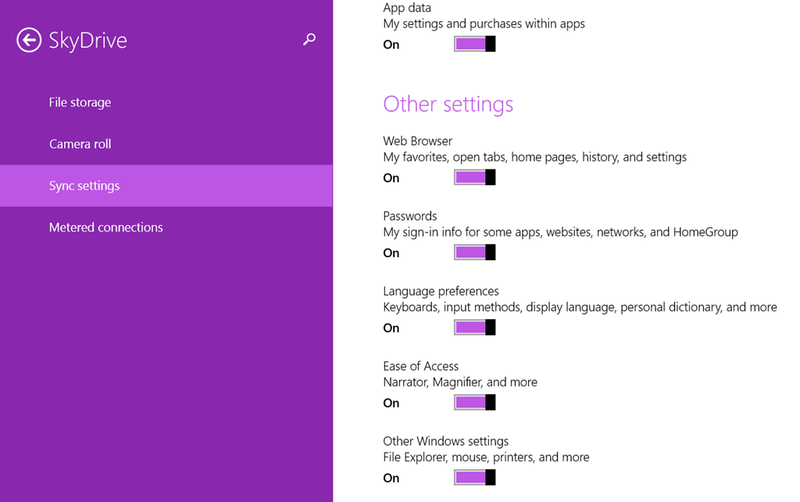 Within that there is a section called Other settings in which you can very easily flick the Passwords option to Off. As with just about everything else in Windows, this can either be done as a one-off, or by Group Policy Settings across an Organizational Unit or Domain within Active Directory. It is important when using Windows that it is probably the most complicated product that is in use by over one billion users. It would be folly to think that Microsoft (or any company) could deliver an out-of-the-box solution that worked for everyone without complaints. However the more options we have that can be configured to our own needs, the better the product is going to be. Personally, I think they have done a pretty good job with Windows 8.1… but if you don’t like a setting, rather than complain about it first see if it can be modified!